We’re not hippies, damnit! We’re digital nomads. 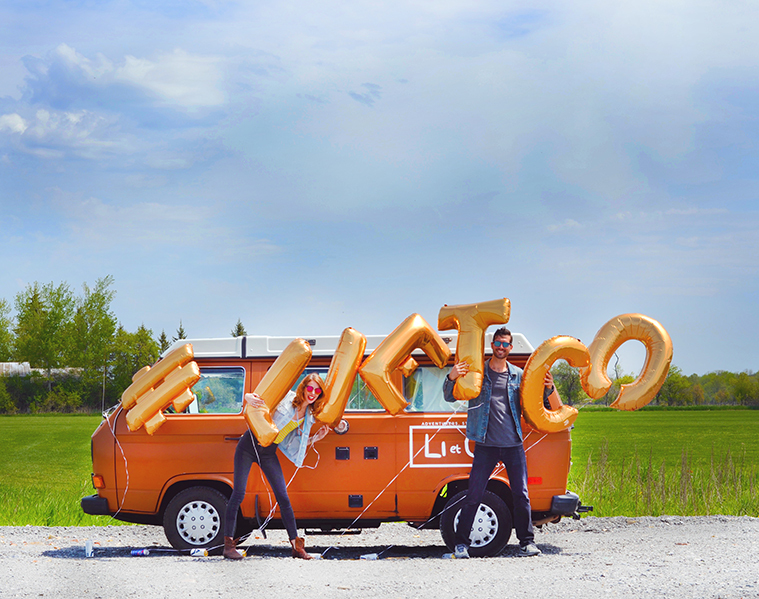 So, we branded the exterior of Li et Co worldwide headquarters (aka our ’83 Westfalia). We’re officially that couple with a hashtag decal on the side of our 1983 Westfalia. Eventually, we decided to go with decals. That way, we would keep the orange paint (and preserve the parts where it’s chipping and rusting), and slap our logo and social cues in a few places. First, we did our research, curious if we could order the decals by clicking around online and then successfully install them ourselves without it looking like a hilariously depressing Pinterest fail. We made mockups. Many mockups. Sitting on a sunshiny cobblestone patio in Toronto’s Baldwin Village, we made a quick phone call to the guys at JD Graphics for a quote, fired them off some renderings, and within 15 minutes, had an appointment at their Cambridge, Ontario shop the following morning at 9 am. For us, exterior signage just made sense. We’re not two hippies driving around in a van; we’re digital nomads running a business from the road. We want passersby to see our social handles, hashtag, and URL, and get curious. We want the engagement. And since we’re driving across Canada in a moving a billboard, why not take advantage of that, and market what we’re doing to the lucky people we roll by? When we eased our rumbling van into JD Graphics’ installation bay, we were sure we’d made the right choice. The guys are knowledgeable and caring, and the shop was beautifully maintained. From start to finish, it took about two hours. We happily hooked up to wifi and tapped away on work while we waited…cuz, that’s what we do, don’t ya know? On the drive home from Cambridge back into Toronto, we had a handful of rubbernecker gawk at our freshly installed art. Eyes on the road, drivers! So, if you see us bootin’ aroud The6ix over the next couple weeks, or anywhere in North American after that, give us a toot, or send us a tweet and use our hashtag, #lietco. If we’re being honest, we love the attention.